Navy officials Saturday identified the San Diego-based Marine at the center of a search in the seas southeast of the Philippines that was called off earlier this week. Cpl. 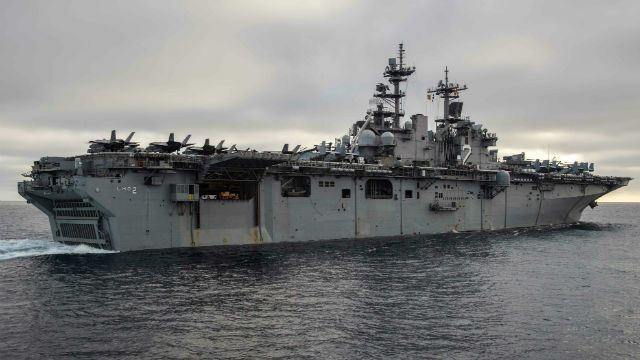 Jonathan Currier, with the 13th Marine Expeditionary Unit stationed at Camp Pendleton, was reported overboard at 9:40 a.m. Thursday while the USS Essex was conducting routine operations in the Sulu Sea. Currier was declared dead on Aug. 17, 13th MEU Capt. Diann Rosenfield said. Currier, a New Hampshire native and a Marine Corps helicopter crew chief, enlisted in August 2015 and graduated from Marine Corps Recruit Depot, Parris Island, in November of that year, according to Rosenfield. He was assigned to Marine Heavy Helicopter Squadron 361 at Marine Corps Air Station, Miramar, and was deployed at the time of his disappearance with Marine Medium Tiltrotor Squadron 166 Reinforced, 13th MEU, aboard the USS Essex. The five-day search for Currier, which covered around 13,000 square nautical miles of the Sulu Sea, Mindanao Sea and the Surigao Straight, was joined by U.S. Navy and Philippine Coast Guard ships and aircraft. The USS Essex, an amphibious assault ship commissioned in 1992, is homeported at Naval Base San Diego. « Is Republican Story on California Gas Tax Repeal Too Good to Be True?